LibriVox is really picking up the pace of audiobook production. Happily, more and more of these free public domain audiobooks being released have a single narrator. 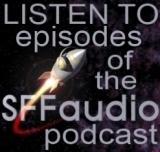 This latest audioboo is a title listed in our 3rd Annual SFFaudio Challenge, it’s a cool short novel by the legendary Robert Bloch – that makes it’s narrator, Gregg Margarite, eligible for a prize! Wanna prize Gregg? 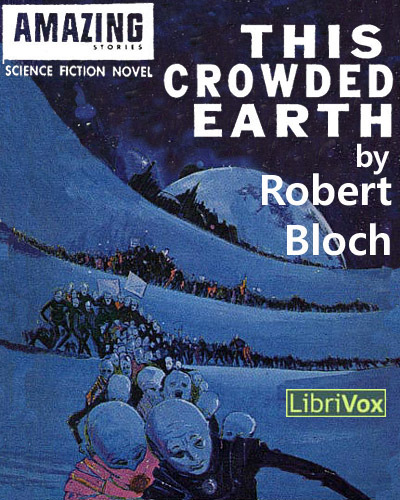 Incidentally, I’ve now put up a ROBERT BLOCH author’s page, where you can find more Bloch on audio, and I’ve added a 1-click subscribe version to our LibriVox + SFFaudio = Instant iTunes Audiobook page too. Robert Bloch (1917 – 1994) was a prolific writer in many genres. As a young man he was encouraged by his mentor H. P. Lovecraft, and was a close friend of Stanley G. Weinbaum. He also wrote many screenplays including Hitchcock’s Psycho, and scripts for the original Star Trek. He received the Hugo Award, the World Fantasy Award, the Bram Stoker Award, and he is a past president of the Mystery Writers of America. Published in Amazing Stories in 1958, This Crowded Earth is a thriller set on an overpopulated Earth of the future.